1. 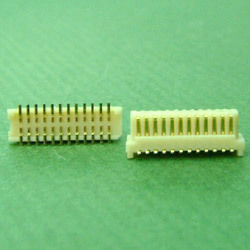 Board to board connector 0.5mm pitch plug SMT type. 2. Contact material: phospher bronze. C5210R-SH. 3. Insulator material: thermoplastric high temperatrue nylon-9T, UL 94V-0. 4. Finish: gold all over nickel. By coustomer request. 1. Current rating: 0.3 amps. 2. Insulation resistance: 100 Megohms Min. 3. Contact resistance: 60 m ohm Max. 4. Dielectric withstanding: AC 500y.